Birds Only -Eyes, product eyes for birds. To the serious wildlife enthusiast, sportsman, or artist, nothing detracts more from an otherwise competently mounted specimen than improper or incorrect eyes. Click here to view more eyes. Europe Eyes offer a breakthrough in artificial eyes. Developed by Danish taxidermist Erling Morch, Europe Eyes are the most beautiful and natural appearing eyes on the market. These acrylic eyes capture the true profile, correct pupil shape, and accurate coloration of a live bird’s eye like no other type of eye available. Discover what the most discerning European taxidermists and North American wood carvers have been using for a long time, Europe Eyes. 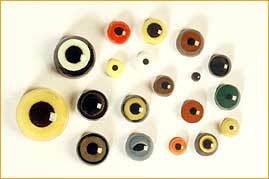 By their very nature, acrylic eyes are much easier to set than the hard, impervious glass eyes still being used by many taxidermists. Europe Eyes can be tipped or tilted into position simply by using a sharp needle tool to grab the edge of the acrylic. This eliminates the necessity of digging around behind the eye and ruining all your sculpting work. After being set to their proper position and coated with a clear gloss, Europe Eyes obtain a look of incomparable lifelikeness. 1-888-850-8822 during normal business hours, Pacific Time.